Copyright © 2013 Muna Moussa Abbas. This is an open access article distributed under the Creative Commons Attribution License, which permits unrestricted use, distribution, and reproduction in any medium, provided the original work is properly cited. Porous alumina was fabricated electrochemically through anodic oxidation of aluminum by means of such a self-organized method. Anodic aluminium oxide (AAO) template with nanopores was grown by two-steps anodization processes from a high purity aluminium foil. The anodization process was carried out in a phosphoric acid electrolyte at ambient temperature with a different duration of anodization. The analysis observation by Atomic Force Microscopy (AFM) showed that nanopore size increased with anodization time. The nanopore sizes of porous alumina were (16.04, 26.19 and 37.39 nm) for (1, 2 and 3 hour) respectively. The discovery of nanoporous materials opened a tremendous flurry of worldwide research, because of their promising and potential industrial and technological applications for magnetic, electronic, optoelectronic structures and nanometric devices. Moreover, the application of ordered nanochannel-arrays as two-dimensional photonic crystals has generated an increasing interest in recent years. Anodic porous alumina film is a promising candidate for starting materials of nanofabrication of various devices [1,2]. Porous alumina is arrays of a large 2D adjustable configuration forms on the surface of aluminum in a selforganized manner when anodized in an acid under specific conditions [3,4]. Since Masuda et al. reported the two-steps anodization process to obtain a self-ordered of pores, new areas of applications have emerged in the fields of magnetic storage, solar cells, carbon nanotubes, catalysts, and metal nanowires. This increasing attraction of porous alumina as template is mainly due to it enables mass production without the use of expensive lithographical tools . Anodic aluminium oxide (AAO) templates have received considerable attention in synthesizing nanostructure material due to their particular characteristics such as controllable pore diameter and periodicity, and extremely narrow distribution of pore size. The pore has ideal hexagonal shape. 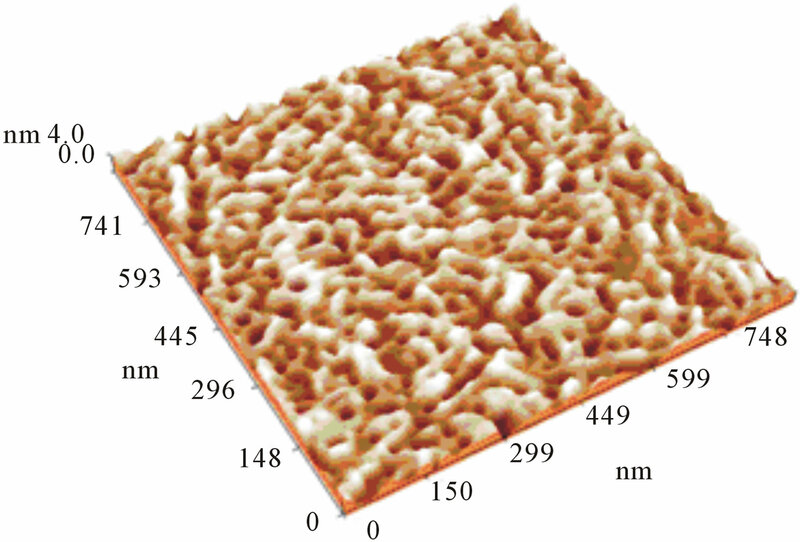 AAO is characterized by a homogeneous morphology of parallel pores which grow perpendicular to the template surface with a narrow distribution of diameter, length and interpore spacing, all of which can be easily controlled by a suitable way of choosing the anodization parameters such as pH of the electrolyte, anodization voltage and duration of anodization [7,8]. Wang and Han  showed that AAO preparation after a two-steps anodization possesses controllable pore diameter and periodicity; therefore further pore adjustment can be caused by exposure to phosphoric acid, which is called pore-widening. Extensive researches have been carried to a better understanding of the physical and chemical properties of porous alumina. The preparing conditions of highly ordered AAO template are highly precise, especially for those with pore diameters under 25 nm. The anodization time is one of the main factors of fabrication for the order of nanopore arrays. Nielsch et al. 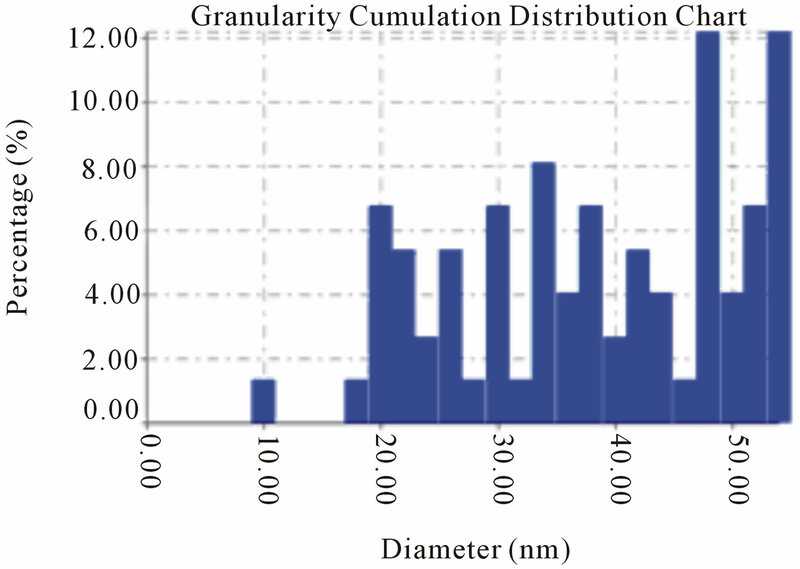 showed that the domain size does not linearly increase with time but has a maximum size and he suggested that it is an optimum anodization time to obtain the largest domain size. This goes beyond the results of Li et al. , Oh et al. and Zaraska et al. they reported that the average domain area is a linear function of anodization time. Lee et al. investigated the anodization of aluminum in malonic acid (H4C3O4) solution. They found that the ordering of cells shows an inverse time dependence on the anodization time. The purpose of this work is to understand and improve the self-assemble of porous alumina under a specific condition with the variation of duration of the anodization. The AAO templates were fabricated by a two-step anodization process. Specimens of High purity (99.93%, 0.3 mm thick) aluminium foils annealed at 500˚C for 3 hour in an N2 atmosphere then it was purged by acetone in an ultrasonic cleaner to clean out the possible grease on its surface. To reduce surface roughness, electropolishing is carried out in a mixture consisting of 1:4 volume mixture of (HClO4) and (C2H5OH) at 10 V for 3 min at 10˚C with magnetic stirring. The samples were later rinsed in distilled water; this step repeats ones again under the same conditions. After the electrochemically polishing procedure, the specimens were anodized in two electrodes electrochemical cell with a magnetic stirrer was used, Pt foil serves as cathode where the Al foil as the anode, the electrolyte was 10% sulfuric acid , the process conducted with 18 V DC at 5˚C for different duration of anodizing (1, 2 and 3 hour). A two steps anodizing procedure were conducted in which the first anodized layer removed by solution of (1.8 wt chromic acid and 6% wt phosphoric acid) at 60˚C. The samples cleaned again as mentioned above to repeat the anodizing process at the same conditions of the first step, then immersed in 6% of phosphoric acid to open the pores where the phosphoric acid is thought to help connect cylindrical pores in the bottom layer to the top layer of the AAO template. 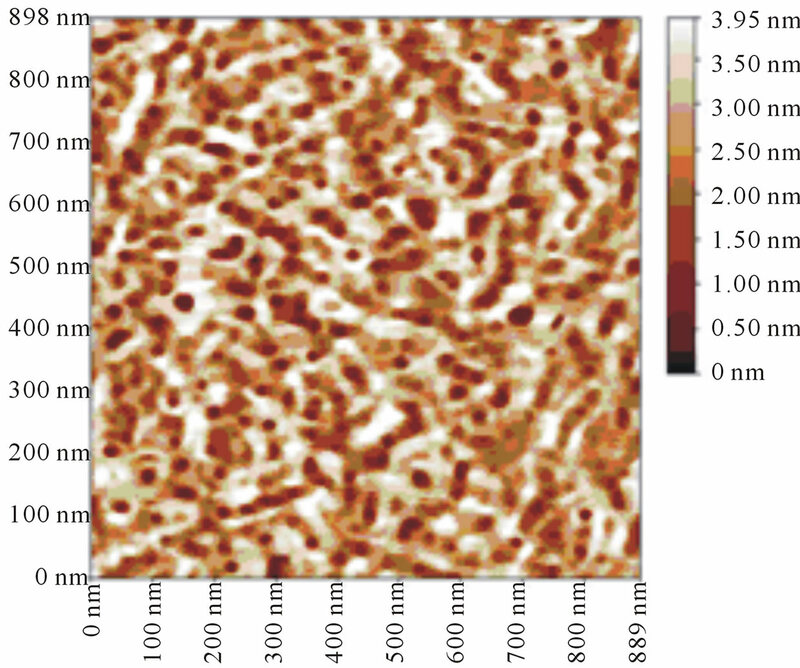 Atomic Force Microscopy (AFM-AA3000) of Angstrom Advanced Inc., USA) was used to obtain quantitative information on the grain sizes of the AAO films as well as the surface roughness. The morphology in the three-dimensional AFM images and the statistical results of the anodized aluminum porous films in a three different times, (1 - 3 hour) are shown in Figures (1-3) respectively. The results show distinctly that an ordered honeycomb structure with this method. Figure 1. 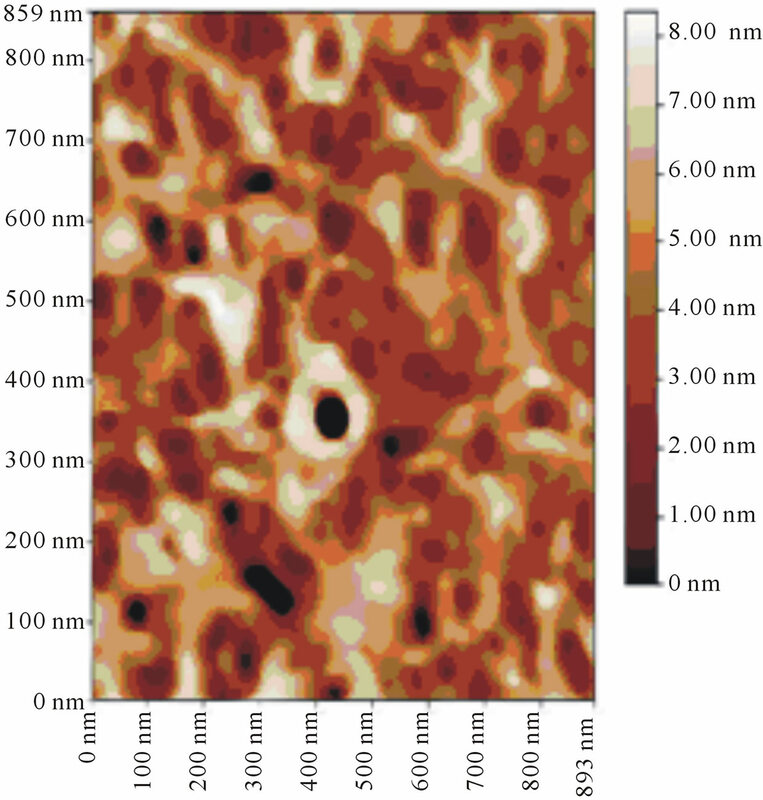 Atomic force microscope topographic views of AAO ionized during 1 hour (a) 2D image (b) 3D and (c) normal granulites distribution report of AAO. 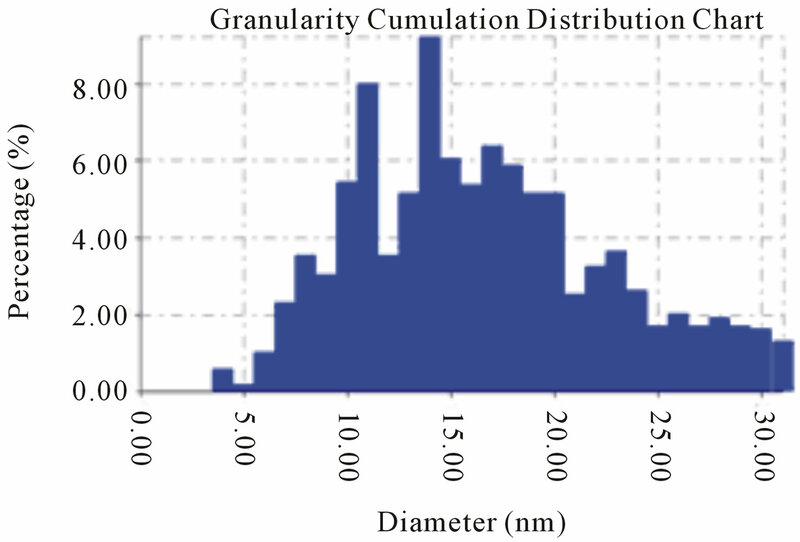 diameter appeared to be 37.39 nm as illustrates in Figure 3. The structure of the pore was more circular with a large opening and separated by a thick pore walls. Figure 2. Atomic force microscope topographic views of AAO ionized during 2 hour (a) 2D image (b) 3D and (c) normal granulites distribution report of AAO. Figure 3. 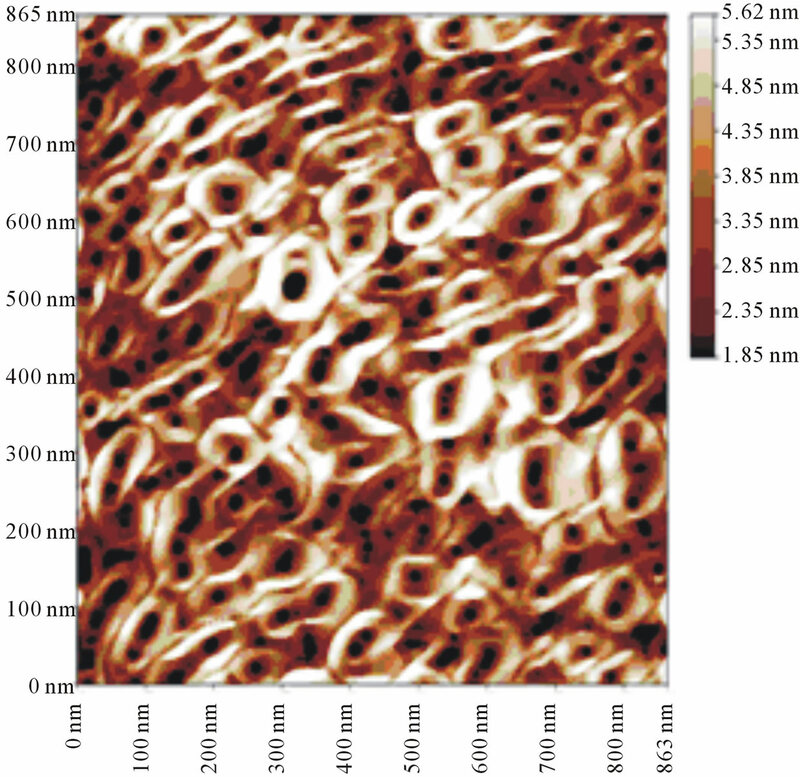 Atomic force microscope topographic views of AAO ionized during 3 hour (a) 2D image (b) 3D and (c) normal granulites distribution report of AAO. mina on the way to the conventional hexagonal pattern. 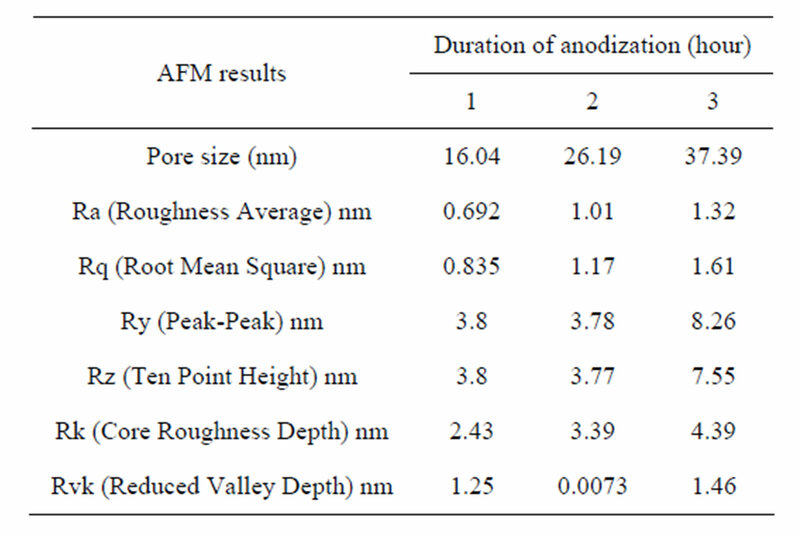 However, the results showed the average pore diameter linearly increased with anodization time. This increase in the pore diameter can be related as a result of prolonged etching of alumina in the acidic electrolyte used for anodizing. In addition, the complex network of pores containing subpores disappears due to the electrolyte etching action. This confirms that the pore diameter can be controlled by the anodization time. This is in agreement with the results obtained by Zaraska et al. and Li et al. [11,13]. It was noticed that by increasing the duration of anodization led to the increase of the films roughness due to the increasing of thickness these results are similar to those reported by Wei et al. who argue that the thickness of the porous oxide film was affected by the anodizing time. These results can be explained through the film morphology, as the film thickness increases the grain size increases too. The surface roughness increases with increasing grain size and appearance of enlarge pores caused by the extension of the aluminum surface, which led to possess an irregular structure and got separated by a thick pore walls. 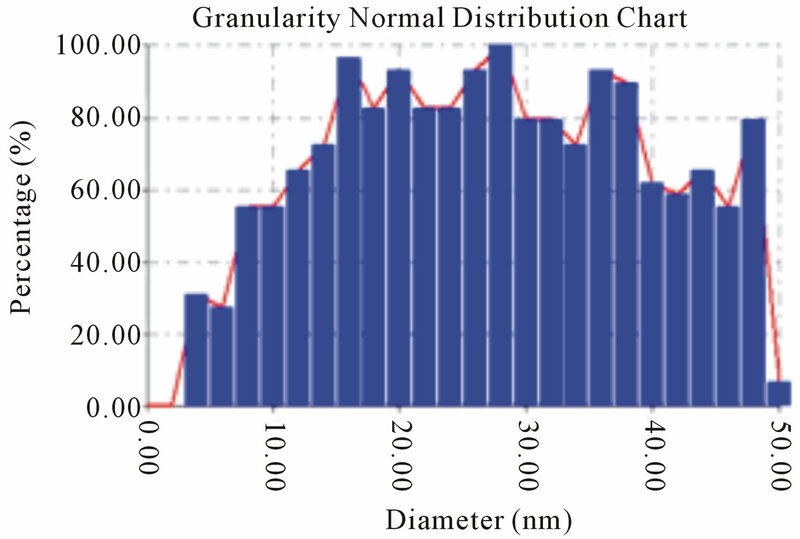 Similar results have been observed by Alam et al. .
AFM results for the AAO nanopurs films prepared at a different duration of anodization are summarized in Table 1. It is worth noting that with a significant extension of the anodizing time a considerable improvement of pore arrangement have not been observed. Therefore, further study is needed to find how the surface condition of aluminum foil can modify homogeneity of pores and significant improvement in surface roughness on an anodic alumina surface. Table 1. Atomic force micproscope results. mation of the layer under applied electric field and Chemical filed/assisted dissolution of aluminum oxide (or alumina) at the oxide/electrolyte interface. The dissolution and thinning of the oxide layer is mainly due to the hydration reaction of the formed oxide layer. 2) Alumina formation at the oxide/aluminum interface. The oxidation takes place at the entire metal/oxide interface mainly by the migration of oxygen containing ions ( or OH−) from the electrolyte. Pores are first formed at certain micro-rough region where the current density is concentrated on after the formation of a steady barrier layer and then the pores grow perpendicularly to the surface with equilibrium of field-enhanced oxide dissolution at the oxide electrolyte interface and oxide growth at the metal/oxide interface. The formed alumina is assumed to be Al2O3. Therefore, the atomic density of aluminium in alumina is by a factor of 2 lower than in metallic aluminium. This means that the volume of the anodized alumina expands to about twice the original volume. This volume expansion leads to compressive stress during the oxide formation in the oxide/metal interface. The expansion in the vertical direction pushes the pore walls upwards. Meanwhile, the repulsive interaction between the pores drives the structural adjustment to form pore arrays like in a honeycomb. The barrier layer at the bottom of the nanotubes (at the metal/oxide interface) acts as resistance to the flow of ions, which needs to move through the anodic film to keep the oxidation active. Greater resistance can be overcome by increasing the applied anodization voltage, which can cause the increase of the longitudinal growth of the pores due to the lager migration velocity of the reactive cation and anion ions, which can be confirmed by the thickening of the AAO the horizontal growth also leads to the enlargement of the pore diameter and spacing. Meanwhile, the adjusted velocity among the pores cannot keep up with the growth in velocity of the AAO and the features of the order of the structure might decrease. Moreover the degree of the volume expansion of aluminum determines either the formation of self-ordered pores or the formation of disordered pores. Anodic aluminium oxide (AAO) film with the nanoporous was successfully prepared by the use of a two-steps anodized method. This study confirms that the duration of anodization is a conditional parameter that strongly influences the porous diameters and the roughness of the films. It was obtained that the pore size increased (16, 26 and 37 nm) in (1, 2 and 3 hour) respectively. I want to thank Dr. Kareem AL-Samuraee for his supporting to carry out this work. N. Taşaltina, S. Öztürka, H. Yüzerb and Z. Z. Öztürk, “Simple Fabrication of Highly Ordered AAO Nanotubes,” Journal of Optoelectronic and Biomedical Materials, Vol. 1, No. 1, 2009, pp. 79-84. S. Phok, S. Rajaputra and V. P. Singh, “Copper Indium Diselenide Nanowire Arrays by Electrodeposition in Porous Alumina Templates,” Nanotechnology, Vol. 18, No. 47, 2007, pp. 1-8. 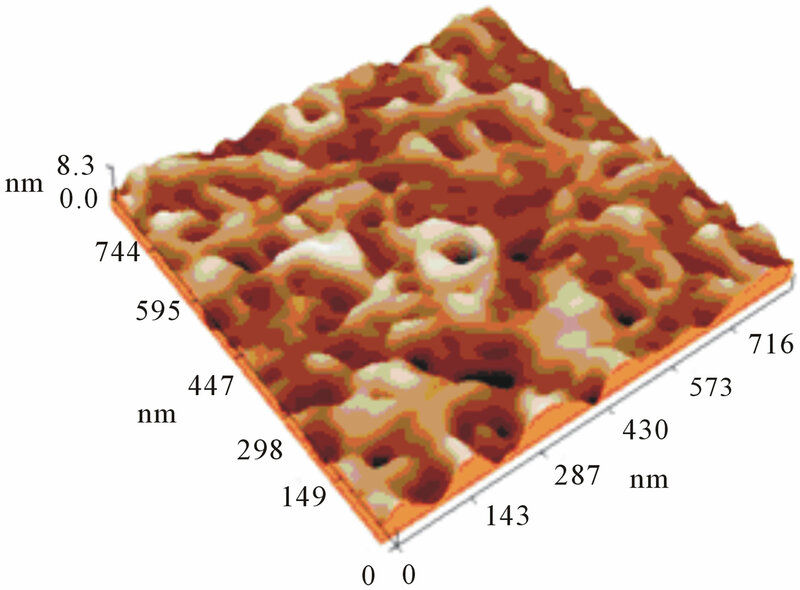 V. Sadasivan, C. P. Richter, L. Menon and P. F. Williams, “Electrochemical Self-Assembly of Porous Alumina Templates,” 2005. C. Sousab, D. C. Leitaoa, J. Venturaa, A. M. Pereiraa, M. Amadoa, J. 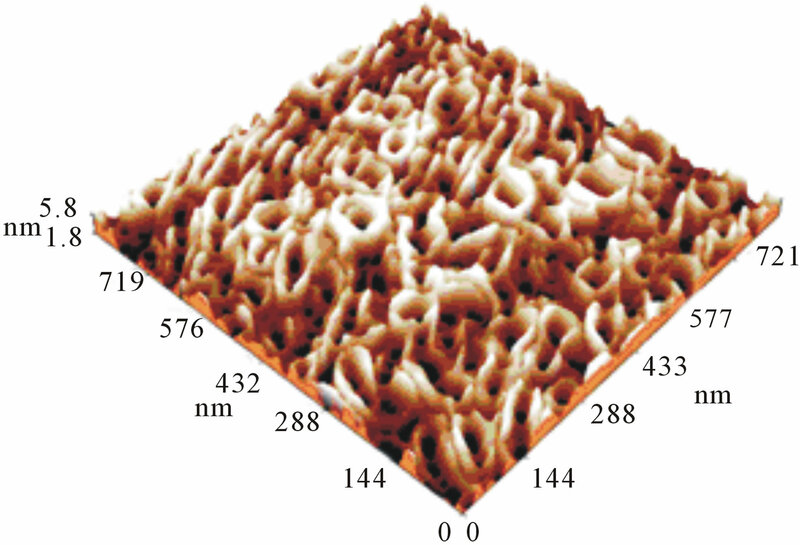 B. Sousaa and J. P. Araújo, “Nanoporous SelfOrganized Anodic Alumina Templates,” 2007. K. Nielsch, J. Choi, K. Schwirn, R. B. Wehrspohn and U. Go1sele, “Self-Ordering Regimes of Porous Alumina: The 10% Porosity Rule,” Nano Letters, Vol. 2, No. 7, 2002, pp. 677-680. L. Zaraska, G. D. Sulka1 and M. Jaskuła, “Properties of Nanostructures Obtained by Anodization of Aluminum in Phosphoric Acid at Moderate Potentials,” Journal of Physics: Conference Series, Vol. 146, No. 1, 2009, Article ID: 012020. W. Lee, K. Nielsch and U. Gosele, “Self-Ordering Behavior of Nanoporous Anodic Aluminum Oxide (AAO) in Malonic Acid Anodization,” Nanotechnology, Vol. 18, No. 47, 2007, Article ID: 475713. W. Wei, S. Li, J. Liu and J. Zhang, “Size-Controlled Synthesis of Highly Ordered Nanoporous AAO Membranes,” Nanoscience, Vol. 11, 2006, pp. 157-160. Y. Xu, G. E. Thompson and G. C. Wood, “Mechanism of Anodic Film Growth on Aluminium,” Transactions of the Institute of Metal Finishing, Vol. 63, 1986, pp. 98-103. O. Sullivan and G. C. Wood, “The Morphology and the Mechanism of Formation of Porous Anodic Films on Aluminium,” Proceedings of the Royal Society A, Vol. 317, 1970, pp. 511-543. G. E. Thompson and G. C. Wood, “Anodic Films on Aluminum,” In: J. C. Scully, Ed., Treatise on Material Science and Technology, Academic Press, New York, 1983. A. P. Li, F. Müller, A. Birner, K. Nielsch, U. Gösele and J. Vac, “Polycrystalline Nanopore Arrays with Hexagonal Ordering on Aluminum,” Journal of Vacuum Science & Technology A, Vol. 17, No. 4, 1999, pp. 1428-1432.